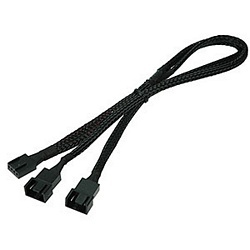 This "Y" cable connects to your motherboard and controls two PWM fans for optimal performance in noise and cooling. One of the two fan connectors carries the speed control signal. Supports most high-quality PWM fans. Supports Intel 775 and AMD AM2 CPU fan 4-pin PWM socket.